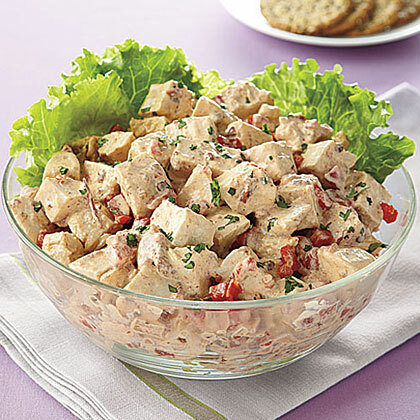 Chicken salad is high in protein and low in sodium. A roasted and diced chicken meat has 231 calories and 45 calories is contained from fat. Onions and chopped celery provide a healthy mixture of minerals and vitamins including potassium, manganese, vitamin c and vitamin B6. Replacing mayo with curd lowers its fat content and its calories. Step 1: In a bowl, combine the 50 gm chopped cooked chicken. Step 2: Add one medium sized chopped onion and mix well. Step 3: Now, add 3 tbsp well chopped celery and mix it. Step 4: Now add the hard boiled chopped egg and blend it all.